The Collie is a large, lean, strong dog. The top of the skull is flat and the eyebrows are arched. The head is wedge-shaped and the muzzle is rounded tapering to the black nose, with a slight stop. The face is chiseled. The teeth should meet in a scissors bite. The medium sized eyes are almond shaped. Eye color is dark brown accept for blue merles, where the eyes may be blue or have one of each color. The small ears are 3/4 erect with the tips folding forward. The neck is fairly long. The body is slightly longer than it is tall. The legs are straight. The tail is moderately long with an upward twist or swirl at the end and is carried low. There are two coat varieties, the rough and smooth. The rough coat is long and abundant all over the body but is shorter on the head and legs an the coat forms a mane around the neck and chest. The outer coat is straight and harsh to the touch, and the undercoat is soft and tight. The smooth coat variety has a short one inch coat all over the body. Coat colors on both the rough and smooth variety include sable and white, tri color of black, white and tan, blue merle or predominantly white with sable, tri-color or blue merle markings. Drugs that have been documented to cause problems in dogs with the MDR1 mutation. The Veterinary Clinical Pharmacology Lab (of the College of Veterinary Medicine) has released a study regarding the interactions of numerous drug interactions in dogs that carry the MDR1 mutation. Collies and other herding breeds are especially susceptible to side effects from these drugs. The interactions can cause side affects ranging from neurologic toxicity to bone marrow suppression. Please take a moment to read and article on the Veterinary Clinical Pharmacology Lab website. We recommend that you print a copy, and ask your veterinarian to add it your dog’s file. Before allowing your dog to receive medication, ask your vet to cross reference the article. Like people, dogs are subject to a large number of inherited eye diseases. Two which can affect a Collie’s eyes should be of concern to all breeders. This is the most common of the Collie eye diseases, but it should be noted that Collies share this disease with several other breeds. Researchers first noted this problem nearly fifty years ago. It was later found to exist in most Collies and in most Collie Families. This so-called syndrome, meaning a group of conditions which appear in conjunction with each other, is present prior to birth. Collie Eye Anomaly can be easily checked with the puppies are 5-6 weeks old, by a qualified Board Certified Ophthalmologist. It is something that your average Veterinarian is not qualified to diagnose. 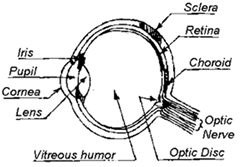 The eyes must be dilated prior to the examination, so the interior of the eye can be examined with an Ophthalmoscope. A dog is either given a “Normal” or “Affected” rating. If given the “affected” type of abnormality is noted. It is used to be popular to use a Grading System and still is being used in certain parts of the country. Currently there is no universal, standardized grading system. Normal: A “Normal” eye rating is of course the best grading there is. (There are also “Go Normals”, which are so mildly affected at a young age, that later, the pale areas disappear, leading to what is termed a “Go Normal”. Keep in mind that these are still in fact affected with CEA.) There are variations even in “Normal” eyes. These correspond somewhat to a dog’s coat color. Thus it is often difficult to judge the pigment in a Blue Merle’s eyes as it is diluted along with his coat color. Choroidal Hypoplasia, Chorioretinal Change: These refer to abnormalities in the coloring or pigmentation of the choroid or central layer of the eye’s lining. This is the most common abnormality found in Collie eyes. Often referred to as mild CRC. Grade I or II, it is the least harmful and least severe form of CEA> Most dogs with this eye grade function normally with no ill-effects or loss of vision. Staphyloma, Coloboma, Extasia: While not completely synonymous, these terms all refer to a cupping or bulging in the eyeball usually in the area of the optic disc. Retinal Detachment: Loosening or separation of the inmost, or retina, layer from the wall of the eye. This may involve a tiny area or the entire retina. It can be either one or both eyes. The complete detachment of the retina results in the blindness in that eye. There is a new Genetic Test for Collie Eye Anomally/Choroidal Hypoplasia. Please visit the Optigen website for details. What have breeders done to improve Collie eyes? When the eye problem was discovered more than 50 years ago, it was estimated that 90% of the Collie population was afflicted with some form of eye disease. Because CEA has involved such a large percentage of the breed, eradication has been slow. Over the years, with the selective breeding and eye checking of breeding stock, the numbers of affected Collies has greatly reduced. All reputable breeders eye check not only their breeding stock, but all puppies that are offered for sale. How is CEA inherited? Most of the specialists agree that Choridal Hypoplasia is carried as simple recessive. For a dog to show symptoms, both parents, even if they show no signs themselves, must carry a gene for the condition. Evidence exists that some other parts of the syndrome are inherited differently. Staphyloma, for instance, rarely occurs expect in the presence of Choroidal Hypoplasia. Dogs recommended for breeding will vary according to the standard set by the individual doctor. The ideal, of course, is to eliminate all but the clear, non-carriers, from the breed. Please not: Even among the dogs that examine “normal”, most are carriers of the gene. They have a “hidden” or recessive gene for the condition and will transmit the gene to half its offspring. Hypoplasia of the Optic Nerve: An undersized nerve which is noted where it enters the eyeball. In extreme cases, this can cause blindness. In the beginning there was a lack of veterinarians trained to examine eyes. Then in 1972, the American veterinary Medical Association formed the American College of Veterinary Ophthalmologists (ACVO), thus providing specialists in the animal eye field. The Collie Club of America encourages its members to have all their pups checked as young as possible by a member of the ACVO. Where there is none in the area, the alternative is to sell a dog contingent on a later check. No dog should be used for breeding until examined and found to be above the examiner’s standard. The other Collie ye problem that can occur in rare instances is Progressive Retinal Atrophy (PRA). Since the name is just what it implies, it can be a progressive disease that may not appear until later in life. This is a completely different and unrelated disease to CEA. As the name indicates, PRA is a progressive disease which refers to retinal degeneration. It can result in complete blindness in one or both eyes. However, Collies seem to be blessed with the fact that PRA seems to have an early onset. Fortunately, this is an eye disease that has largely been eradicated thanks to breeder’s efforts of test breeding potential carriers. Since PRA is a simple recessive gene, it is much genetic marker for this disease, which will further reduce the occurrence. Currently there is no genetic test for PRA, but rumor is that researchers are very close to finding a DNA marker. PRA has proven to be a simple recessive in all the breeds studied. Again, this means that even though the condition is not present at birth, both parents must be carriers. If one parent has PRA, half the puppies may develop PRA, but all will be carriers for the disease. Early signs of the problem may be noticed by the owner as “night blindness.” The dog has trouble seeing in dim light and will bump things. An expert may detect signs in the eye at six months or younger.